Website Designing is a process in which the developers and designers work together to bring a layout of elegance with effectiveness to the business’ online presence. 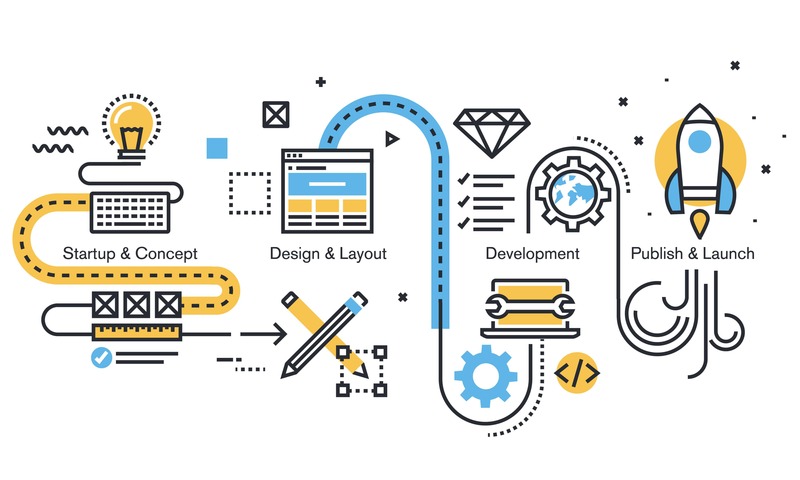 In the website development process, the website design plays the most crucial role in enhancing the user interface and experience on the website. The UI and UX again are the major role players in boosting up the website traffic and subsequently increasing conversion. Your website’s UI, if better designed, can raise the conversion rate by approximately 200% and the UX can harvest up to 400% of conversion rates. The numbers above show how critical are UI and UX designs in a website’ success. Thus, here we bring nine helpful tips to achieve success with the efficient UI & UX website design process. Always understand that your website is not the only one on the web and that your business is not the lone service provider in your niche. Why am I saying this? This is to remind you that the time of the visitor is quite an important factor. No visitor would like to wait for more than 3 seconds to see the website loading. Design your website such that it loads within the fractions of seconds on all the devices (even the ones that have the slowest internet connection.) Use the graphics or images those have the least load impact on the website. The longer the loading time, the more restless and irritated will the visitor get and leave the website without even checking what it has on your services. We all know that the Content is the king on any website. However, if you are going to accessorize it all, it is going to puzzle up your audience. It will help if you keep the content as simple as possible which is quick to understand by the visitors. The ornamental content beautifies the website; however, it is sometimes quite difficult to understand everything with the wandering words. Don’t mess up with the eyes and brains of the visitors. Clarify what is your website up to, what is your business up to and what do you want them to do. If you are a web designer having long years of experience; you would be having stock of your old designs which you would have specially created. What was the last time that you checked them; probably not in the recent time. Recheck them, try reviving something out of them. A design is never limited to a single layout. Make some small touch-ups in your previous design, and you will find an all-new website design. More of it, you can pour out some information that worked last time, and you can enhance it to use this time as well. This re-innovation of designs will help you save on the cost and time during the development process as well. Always ensure that your website design is thoughtful, well organized and easy to navigate. Navigation on any website is a critical point when checked about the user interface. Make sure your page scrolling functions perfectly. The web pages should neither be too long nor too short to scroll. Consider checking the page size is adequate. Web pages with clear information are more sound to navigate than the ones which have all the information in one corner. Make the sections of your products and services thoughtfully and mention that explicitly on the top. Transitioning from one page to another should not be taking too long. Otherwise, it will make the viewers wait, and they may get irritated. A website which is easily navigable is more likely to get the visits of viewers again and again than the one which is difficult to navigate and move through the pages. It is needless to remind you that the present generation and the generation coming will be using even more smartphones. Well, this point is where you need to understand the importance of mobile responsive design. Be considerate and understanding that you can’t restrict the crowd to use the internet on the desktop devices only. Instead, you need to design your website so that it functions with the same efficiency on mobile phones as well. Make sure that the website loads even faster when viewed on the mobile phones. Ensure that the page scrolling is rapid and nicely adjustable according to the screen size.Check if the page size is nice fitting and adjusting according to every devices’ screen size. It’s not only because of the viewers that you need to design the mobile responsive website; but if you want your site to be high ranking on the search engines, you need to make it responsive. While talking about optimization, why do we need it first of all? Well, you have a business website, that’s awesome; but, is that enough alone? The answer is NO! You need to make your website visible among the top of other sites competing with you in the market. The highest visibility on the search engines is the only way which will bring more traffic to your website. Make it a daily habit of applying the steps to boost your visibility on the search engines. Use proper analytical tools that calculate all the exact details such as the number of visitors on the site in the defined period, the location from where you get the most traffic and many others. Work on optimizing your website for boosting up the conversions as well. Prepare effective CRO strategies to convert the viewers into the customers. The generation of tech is innovating more with the web apps. Make sure you have a responsive web app for all the devices, be it mobile or the desktop. Design your web app so efficient to make it a complete store for all your business activities. Enhance the design by including the push notifications, and animated page transitions. Also, try to add the parallax design which gives the web app an altogether different look and feel. We do not have to wait for any other future to see the machines working as humans; today it is the day we can see that. The world is getting advanced, and so do you should be. With inventions such as Siri and Alexa, you can think about how innovatively you can play with your web design.You can include AI on your website such as a ChatBot which will intrigue the visitors to fill up their details while chatting with the bot and will help your business make the necessary database. Machine learning is pioneering day by day and is up with the inventions which a human mind can only see in dreams. Well, this is the time to realize your dreams. Just add these tools wisely in your designs and make your website even a more intuitive place to be with and deal. A business never runs alone on the application. You need to check and test the results obtained after that. Consider auditing the strategies you applied to boost up your website’s visibility and traffic. Study thoroughly about every strategy and point out the results out of each. Compare them internally. Also, don’t forget to study your competitors. Learn about the strategies they apply, check if they work better than yours, and take the necessary points from them. Once you are done with the audit and took out necessary points out of it, prepare a new strategy to improve the design. Test the strategy with the proper testing tools and then apply it to the final layout. To please a visitor and convert them into a user and then the customer is vital as well as the most challenging task for any business. Always remember, you are capable of innovating no matter what the situation or the present state is; you can take up the old one and develop it into a thriving new design. Consider every point mentioned above thoroughly. Take out time to study more and more about how web design can improve the UI and UX and help to bring lots of traffic and conversion to your business.